Can you remember the time when you didn’t get emails? You didn’t have a mobile phone (or phones, because let’s be honest, a lot of us have more than one)? Vast swathes of your time were spent sitting in the downstairs loo on the landline phone, which incidentally wasn’t even called a landline phone because the mobile hadn’t been invented yet so there was no need to differentiate (the loo bit was optional, but, in our house the only room in the house with a lock where I would spend literally hours perched on that porcelain seat talking to boyfriends – understand I had a little brother who used to make odd slurping noises when I was on the phone to boys, thus necessitating me sitting on loo, with the door locked freezing my bottom off – downstairs loos invariably have no radiator, at least that was the case in the early 90s in my house). It was also a time when you still got LETTERS. Letters with actual handwritten envelopes, postcards with your friends wittily writing everywhere when they had actually had to go into a tabac and ask for a timbre pour Angleterre to get it back to you. A postcard said so much more than a Facebook update… there were letters from University’s offering you places (or not, thanks Liverpool…), letters from friends you met on holidays; fanzines that had been carefully constructed using a parents copying setting on a fax machine (just me? ), every envelope addressed to Miss H Peters offered something unknown and exciting. I mean the letter wasn’t a new construct, obviously, they’d been around for quite some time. I mean papyrus scrolls and stuff, those pesky Egyptians and their crazy hieroglyphs that befuddled the world for years until the Rosetta Stone was unearthed. There was the introduction of wax seals that necessitated the Signet ring to prove from whence it came, and lithe young messengers would mount their trusty steeds and delivery them off around the land. The letter was a physical, tangible thing, ripe for interception (I can still remember steaming open letters above the kettle). We still leave an imprint now of our correspondence, but it’s all filed so tidily away in those Outlook folders. It’s not like it used to be…. I mean clearly, it’s more efficient, but letters were (and are) beautiful things. There are anthologies of letters from history that you can buy because people wrote so beautifully – I’m yet to find any email based anthologies (though give it a year or two, and there are plenty of twitter parodies that have been made into e-books). Letters bought words to life. The subtle nuances; the PTO’s. The fact that you could write in big bold letters across them, if for example, you were being dumped by a long distance love. For example. I’m sure that must have happened to someone who was definitely not me. You could have even thrown one on a fire in rage if you’d been of such an inclination – infinitely more satisfying than sending an email to the trash… Again someone might have done that. Who was definitely not me. So it begs the question: why in this day and age when we don’t send each other letters do we still send a wedding invitation. Trust me, you’d get a speedier response if you pinged an email out there, up it pops in outlook whereupon it is immediately cross-referenced with the calendar with a response sent straight back to you. Yet we persist with sending wedding stationery. And it’s not *just* stationery: proper old school methods such as foiling and die-casting are all completely and gorgeously used and it doesn’t feel gratuitous or as though they being used for affectation, we LOVE the old school methods. Invitations that are hand-finished. Even super brand new methods such as laser cutting as seen by designers such as Cutture and Intricate Create – these designs will often have a shimmering Swarovski hand finishing the work done by machine, and there is no machine that can tie a bow in a ribbon like a human hand. But while we’re metaphorically burning books (until they invent a Kindle that can be dried on a radiator after being dropped in a bath, I’m staying old school) and we’re emailing everything else, of updating our statuses with family births and deaths, why do we still send physical wedding invitations? c) Look how super stylish our stationery is folks, savour it, the big day is going to be that little A5 card mult-i-plied. I caught up with Jac of Eagle Eyed Bride who have not only given us an exclusive reveal of their new collection (swoon), who not only create some fabulous and original wedding stationery (often hand finished, natch), but who also produce all sorts of other products too ideal for adding something unusual interest to your day all in keeping with the stationery that you choose. Your choice of wedding design and styling personalise your day. 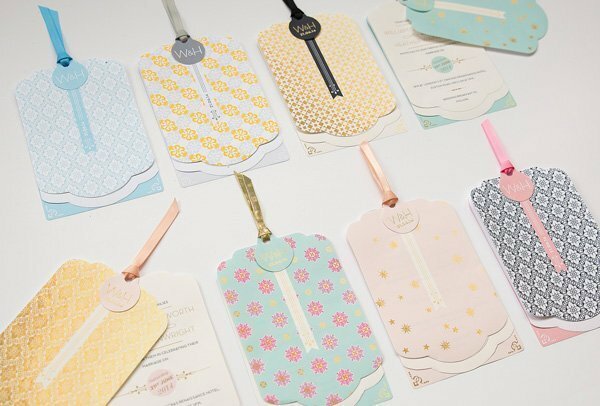 The wedding invitation sets the initial tone, but then across your wedding celebrations there will be tables to style, finishing touches to add… it can be a little intimidating, but at Eagle Eyed Bride they have utterly gorgeous designs and schemes that they carry through to their finishing touches, meaning that not only do you have a one shop for your stationery needs, but that you know your chosen pom pom will match your beautifully designed invites, which in turn will be complimented by your zingy straws. Simples. How was Eagle Eyed Bride started and where did the Eagle Eyed Bride dream begin? What is your favourite wedding you have designed for to date and why? Where do you get inspiration from for your new collections? What do you feel are this year emerging wedding design trends? “I think the key trend is away from DIY. It’s all getting much more elegant, more refined, and using methods that you can’t recreate at home. Everyone is asking about foiling – we all love a bit of lustre and finesse. Florals remain strong as does the stylised deco feel. Lace is going to be another trend staying firm in 2014 as is monochrome. Why are stationery methods like letterpress, foiling, die -cutting still so relevant in a digital age? What is Eagle Eyed bride up to in 2014? Who’s on your “Love List” in the wedding industry? Elizabeth Cake Emporium Makes simply stunning wedding cakes. Anushe Lowe Photographed Katie’s wedding and is generally brilliant. Paula Rooney An amazingly talented florist. Daft Punk. All of it. James Brown & Ray Charles – again, all of it. Mostly on a Friday to get us in the mood!